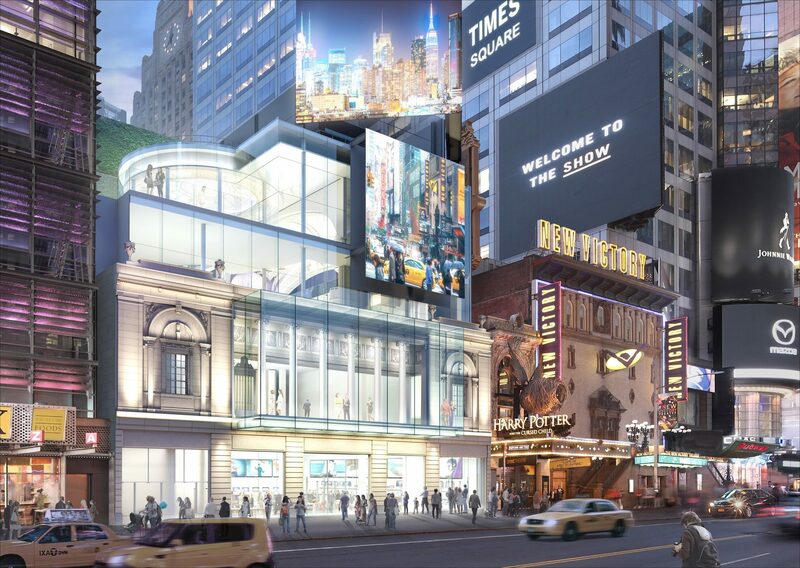 Times Square Theater is in the midst of a major facelift that will see the front of the historic building literally lifted up. The historic theater at 215 West 42nd Street that was designed nearly a century ago is being transformed into a unique retail space by Stillman Development International. The developers tasked Beyer Blinder Belle with reinventing the 100-year-old theater that has been vacant for the last three decades. As a historic property, the developers are required to maintain certain historic elements of the building, but Armen Boyajian, executive vice president at SDI, felt the project also aligned with the company’s philosophy. SDI is planning to preserve the major elements of the Times Square Theater, including the proscenium arch that frames the theater’s stage, the decorative plaster dome at the top of the theater, the box seats, and the many other original detailed plaster elements. Boyajian explained that they conducted historical studies and would extract any plaster of significance. “We spent months with architectural conservators, studying the plaster, literally climbing all over the scaffolding for months and documenting every square inch of the elements we’re taking out and restoring,” Boyajian said. The decorative plaster elements would be cut into pieces and stored in a warehouse temporarily until it undergoes a restoration process. While the historical elements are being restored, the developers will be cutting out the façade of the building and hydraulically jacking it up. The process will make room for the third and fourth floors, while also letting SDI create a 23-foot-tall glass enclosure on the second floor that cantilevers over 42nd Street to allow visitors to feel like they’re floating above the streets of Times Square. Once completed, a spiral staircase will lead visitors up to the third and fourth floors, that feature the historic dome directly above the staircase and the proscenium arch that acts as a gateway to the event space that is fit for a restaurant or food hall, Boyajian said. “All these elements will come back and be fully restored and placed up there as a reminder to the historic nature of this place,” Boyajian said. The new five-floor 50,000 s/f space will feature more than 100 feet of retail frontage on 42nd Street, a rooftop space with room for a food/beverage or entertainment tenant, and LED billboards. Boyajian said he expects the restoration and façade lifting to go from summer to fall and the demolition and excavation to start in 2020 for an early 2021 completion. Colliers International will be in charge of leasing the space. “It’s challenging of course but, in the end, it’s one of those spaces where you’re going to walk in and say, ‘Look at this, it’s amazing,’” Boyajian said.